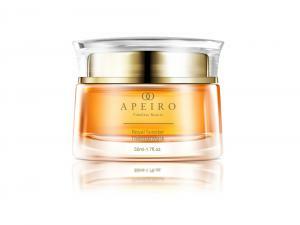 Ultra-luxury skincare brand Apeiro offers a closer look at its exclusive self-heating Royal Scepter Thermal Mask. NEW YORK, NEW YORK, USA, April 16, 2019 /EINPresswire.com/ — An organic, thermal, self-heating mask, Apeiro's Royal Scepter Thermal Mask is making waves among the ultra-luxury skincare brand's customers. Touted to purify the skin for a smoother, more vibrant, and more youthful appearance, Apeiro's vice president of operations offers a closer look at the exclusive one-of-a-kind formula behind the product. "Our exclusive Royal Scepter Thermal Mask is an organic, thermal, self-heating mask which instantly and gently warms the skin upon contact," explains Eric Inbar, vice president of operations for Apeiro. When placed on the face, he says, the one-of-a-kind formula not only feels 'mildly toasty,' but also helps to open up and intensively purify pores to allow effective application of further serums or creams. "This innovative and meticulously developed mask formula cleanses and refines the skin by absorbing excess oils, expelling pore-clogging dirt, and removing dead skin cells," further reveals Inbar. He continues, "Infused with organic herbal extracts, our wonderful Royal Scepter Thermal Mask is formulated to reveal the smooth, vibrant, and youthful skin that's been there all along." The ultra-luxury thermal mask is available exclusively from Apeiro, all of whom's products are proudly certified cruelty-free, clinically tested, and fully FDA approved. "For the best results, apply our Royal Scepter Thermal Mask to a freshly cleansed face, avoiding the eye area," Inbar explains. "Leave the mask on for 10 to 15 minutes, then rinse off with cool water to reveal a glowing complexion," he adds. Customer feedback for the product is glowing, too. "I have to say, Apeiro's Royal Scepter Thermal Mask is very impressive. The packaging is tasteful, the container is beautiful, and the product itself is amazing," says regular Apeiro client Diana. "The mask just feels great on the skin, and the scent is also a nice addition. My skin feels smoother and cleaner, and I'm noticing a significant improvement in overall appearance," she adds. "As a woman in my mid-30s, I'm in love with Apeiro's Royal Scepter Thermal Mask!" adds an equally delighted Mary, another Apeiro customer. "The mask is warming, without being too hot, and has the tightening feeling, without being too drying," she goes on, "leaving my pores smaller and my skin smoother. It's everything I've been searching for in a thermal mask." A third review of the Royal Scepter Thermal Mask from Stephanie adds, "My skin was softer and noticeably tighter after just one use. I also noticed that it felt nicely moisturized. Loved it!" Apeiro's Royal Scepter Thermal Mask is part of the wider Royal Scepter Collection which also includes the brand's Royal Scepter Serum, Royal Scepter Cream, and Royal Scepter Silk, a potent and luxurious gel-cream. For more information about Apeiro's Royal Scepter Thermal Mask or the complete Royal Scepter Collection, please visit https://www.apeirotreatments.com/product-category/royal-scepter-collection/.